Growing up in San Diego we used to go to a Mexican Restaurant where they would make guacamole at our table side using a mortar and wooden stick. My family has been using their same ingredients ever since. Mix onion, garlic, jalapeno, and tomatoes in a bowl. Add avocados, cilantro, lime juice, salt, pepper, olive oil and toss gently. Serve with tortilla chips. *You can prepare and mix everything but the avocados and olive oil in a bowl the night before. Mix the avocados in as close as you can to serving time because they will turn brown. 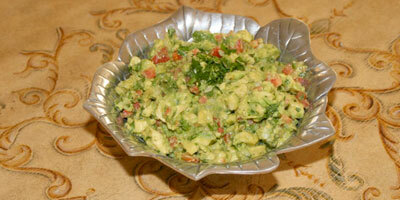 It also helps to put one of the avocado seeds in the guacamole to keep the avocados from turning color.